Holiday.gr - Vothonas, a trip to a myth! 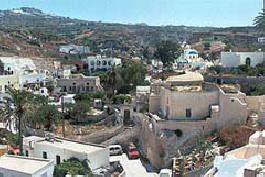 The very small village of Vothona is in the southeastern side of the island and seems to be an extension of Mesaria. During your stay in Vothona,you would like to visit the two small churches, built in caves. The Virgin Mary of Tripa and of Sergina. Most houses in the village are carved insides the rock. Been to Vothonas ? Share your experiences!